Mayor, Aldermen and Burgesses by Parliament or Statute. Originally, such conferment conveyed special privileges of various kinds upon the recipients, but, over the years, and especially since the passing of the Reform Act in 1983, the conferment is purely honorary. The Freedom of the Borough is the highest honour that a Council can bestow and the tradition is maintained as a means whereby public recognition may be given to the recipients as an expression of the highest esteem in which they are held by the Council and people of the Borough. 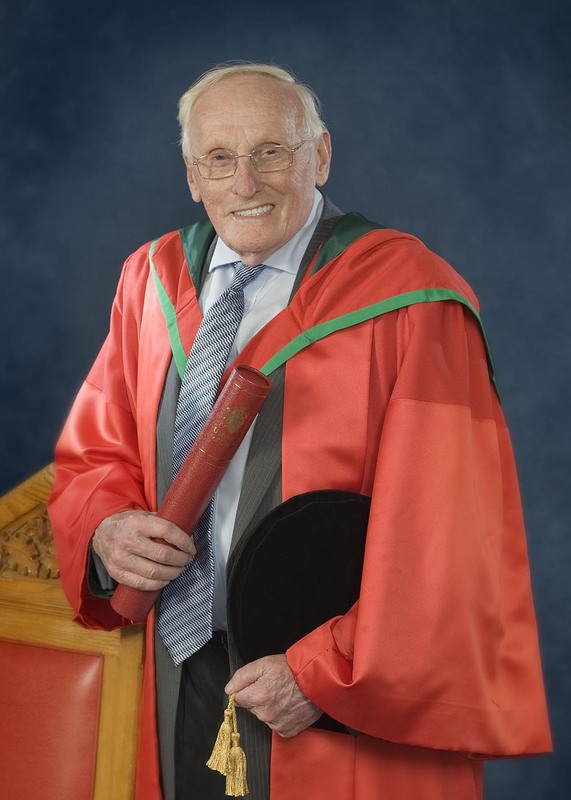 William Wright was born in 1925 the elder of two children and grew up in Ballymena. On leaving school he attended the technical college, going on to found Robert Wright and Sons Limited in 1946, along with his father Robert Wright, later becoming Wrights Group Ltd. The company thrived under the leadership of the father/son team, becoming the leading commercial body builder in Northern Ireland by the 1970s. Sir William Wright then masterminded the company’s entry into the wider UK market, where it has become one of the UK’s leading bus manufacturers. Today, Wrightbus is one of Northern Ireland’s largest employers, manufacturing technologically innovative vehicles for service across the globe, from the UK to the USA to Hong Kong and beyond. The company’s success is primarily due to Sir William’s foresight and persistence in introducing new technologies and developing new relationships with key partners within the industry. The company launched the UK’s first pure electric bus in 1998 and Sir William went on to lead the way in developing hybrid and hydrogen bus technology, including the New Routemaster for London. For many years Sir William has been a leading proponent of the development of environmentally friendly technologies; his vision is to improve air quality in towns and cities globally. Even today, he continues to take a close interest in product development. A legacy of his commitment to the development of new technologies is the William Wright Technology Centre, a joint venture between Wrights Group and Queens University, which was opened in 2016. The centre promotes research and advanced engineering to facilitate the creation and incubation of technologies for the future development of the bus industry. William Wright was awarded an OBE for services to the bus industry and the community in 2001. In 2011 he was awarded a CBE for his services to the bus industry. He was further honoured in May 2018 when he was made a Knight Bachelor of the British Empire for services to both the bus industry and the UK economy. Alongside his ever-growing bus business, Sir William Wright took an active interest in politics, and he served on Ballymena Borough Council from 1981 to 1985 and again from 1993 to 2005. Throughout his career in industry and in politics Sir William’s wife, Lady Ruby, whom he married in 1954 has been his constant companion and support. They have three children, ten grandchildren and nine great-grandchildren. Family and faith continue to be at the centre of this remarkable man’s life. You can download the Freedom of the Borough booklet for Sir William Wright CBE here. 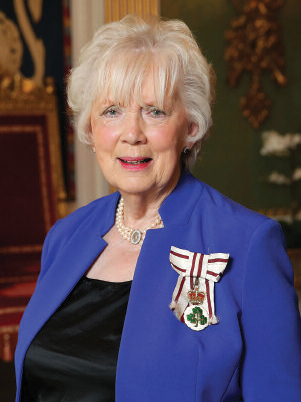 Mrs Joan Christie CVO, OBE was appointed Her Majesty’s Lord-Lieutenant for the County of Antrim in September 2008, on the retirement of The Right Honourable Lord O’Neill TD JP. entire community, especially our young people. As Lord-Lieutenant she has welcomed members of the Royal Family and world leaders to Northern Ireland, including HM Queen Elizabeth II in 2016 and HRH Prince Henry of Wales in 2017. Leading by example, she has organised county-wide celebrations for occasions such as Her Majesty’s Diamond Jubilee and 90th Birthday celebrations. A strong advocate for the Armed Forces, Mrs Christie brings genuine empathy, with her late husband Col. Dan Christie having served with the North Irish Horse and the Ulster Defence Regiment. She has been instrumental in bringing Armed Forces Day to County Antrim on a number of occasions, giving the public the opportunity to recognise and encourage those serving in the Armed Forces and the wider Armed Forces family. She is also a tireless supporter of the Cadet movement, honorary patron of the Army Cadet Band and is closely involved with the Sea Cadets. Mrs Christie has given a lifetime of service to Northern Ireland. Born in Castlederg, County Tyrone she began her career in the civil service as private secretary to several Secretaries of State, she went on to serve and hold significant positions on a number of public bodies and charitable committees, in the arts sector and in the business community. These have included Queen’s University Belfast Senate, North Eastern Education and Library Board, the Council for Catholic Maintained Schools, the Royal British Legion, the District Policing Partnership, the RUC George Cross Association, the UDR Benevolent Fund, RNLI, Macmillan Cancer, the Women’s Institute and Girl Guiding. In recognition of her personal service and dedication, Mrs Christie was awarded the private honour of Commander of the Royal Victorian Order by Her Majesty The Queen in 2017. This followed on from an OBE for services to Education in 2005 and previously an MBE for services to Government in 1976. Mr and Mrs Christie married in 1979. They made their home in the north Antrim area and have three children – Joanna, Harriett and Marcus - and five grandchildren – Joe, Angus, Patrick, Ned and Rose. Mr Christie passed away in December 2008. Mrs Christie will retire from the position of Lord- Lieutenant in June 2019. Every regiment has its own traditions and history that are treasured by those who have served. The North Irish Horse has an outstanding record. They can look back with pride on the achievements of its soldiers in two world wars and its excellent performance in the post-war period as a Territorial Army unit. The fact that it has survived a series of defence reviews that have drastically reduced the army is a testament to this continued success. The North Irish Horse arose from the aftermath of the Boer War in South Africa. Following this war, The Militia and Yeomanry Act 1901 was enacted, allowing the raising of new yeomanry regiments, two of which were the North of Ireland Imperial Yeomanry and the South of Ireland Imperial Yeomanry. Both were sanctioned on 7 January 1902. Four squadrons were formed with the Regimental Headquarters and A Squadron based at Skegoniel Avenue in Belfast, close to the present day Dunmore Park Camp. The other squadrons were located as follows: B- Londonderry; C- Enniskillen and D - Dundalk. The first annual camp was held at Blackrock Camp, Dundalk from 28 July to 12 August 1903. Thereafter annual camps were held at the Curragh, Ballykinler, Dundrum or Bundoran. On 1 September 1908 the North of Ireland Imperial Yeomanry became the North Irish Horse, becoming Special Cavalry Reserve in July of that year. On the 4 August 1914, at the outbreak of war, the North Irish Horse received mobilisation orders and sailed to Le Havre in France, commanded by Major Lord Cole. The North Irish Horse were the very first non- regular British troops to arrive in France and see active service. They played a significant role in bringing the defeat of the Kaiser’s German forces and the end of the Great War. The total number of personnel of the North Irish Horse who served was 70 Officers and 1,931 other ranks, of whom 27 Officers and 123 other ranks were killed. A memorial window in Belfast City Hall was dedicated to the Regiment in 1925. After the war, the Regiment no longer existed as a fighting unit and was classed as ‘disembodied’. On 11 September 1939 a special Army order re-embodied the North Irish Horse, establishing it as a light Armoured Regiment of the Supplementary Reserve and in 1941 were equipped with the new Churchill tanks. The North Irish Horse played a prominent part in the North African campaign and were the first allied tanks to enter and liberate Tunis on 8 May 1943. In April 1944 the Regiment supported the 1st Canadian Division in a frontal attack on the Hitler Line, a defensive barrier in central Italy. Success came at a high cost, with the Regiment losing 36 men and 32 tanks. In appreciation of the support they received, the Canadian Government awarded the North Irish Horse the honour of wearing the Maple Leaf. Since 1947, when The North Irish Horse became part of the Territorial Army, the regiment has withstood a number of reorganisations over the years. Most recently this saw the North Irish Horse subsumed into The Scottish and North Irish Yeomanry under a wider reorganisation of the Yeomanry regiments. It is one of the Army’s Reserve Light Cavalry Regiments carrying out combat reconnaissance. The regiment has squadrons in Ayr, Belfast, Cupar and Edinburgh, B squadron being the North Irish Horse squadron. The Scottish and North Irish Yeomanry (SNIY) is the newest combat regiment in the Army Reserve, entering the Army’s Order of Battle on 31 October 2014. From 2003 and the outbreak of war in Iraq to the end of the British campaign in southern Afghanistan, the North Irish Horse had 55 deployments to Iraq, Afghanistan and the Balkans.